DUMBARTON took a significant point in a 0-0 draw on the road against league leaders Cowdenbeath this afternoon. Conditions at Central Park were grim weatherwise, and both teams struggled to make much of the game - despite chances at both ends, especially towards the close. Lewis Coult headed close for Cowden on 84 minutes, while Dumbarton's Martin McNiff almost broke the deadlock in the final minute of the match. The result keeps Sons well in touch with the play-off places in the Irn Bru SFL Second Division. Next up is a visit from Forfar Athletic to the Rock on 3rd December. DUMBARTON'S road to Hampden was blocked today following a comprehensive 3-0 defeat at Brechin City. A lacklustre performance from Sons saw them dumped out of the Scottish Cup in tough conditions at Glebe Park. Malloy opened the scoring for the home side on 26 mins and veteran Charlie King made it 2-0 to City in the 77th minute. Sons were thrown a lifeline late on when they were awarded a penalty but Gilhanery missed and Walker's follow-up flew wide. 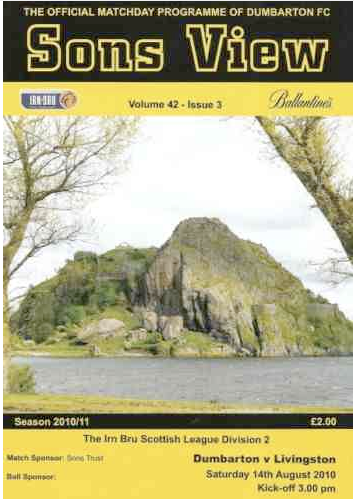 This episode summed up the day for Dumbarton. Substitute Paul McManus wrapped things up for Brechin in stoppage time to seal a deserved win. DUMBARTON secured a convincing 3-0 victory over East Fife at the Rock this afternoon, dominating for significant periods of the game and looking much more solid at the back. In the first half Sons struggled to turn possession into real chances. Then Scott Agnew opened the scoring on 35 minutes with a superbly flighted free kick from a central position. The visitors came out fighting after the break, but Sons were soon back in control. Good goals from Mark Gilhaney on the hour and Alan Lithgow eight minutes later put the result beyond doubt. SONS' grip on the Stirlingshire Cup, which they had won on the two previous outings, was finally broken tonight, following a 5-4 penalty shoot-out defeat away against Falkirk. With the match tied at 1-1 after 90 pulsating minutes, the Bairns triumphed in a dramatic spot-kick contest that went to sudden death. The match sprang to life in 9 mins when Ally Graham expertly headed the opening goal. But Sons drew level through a fine David Winters chip on 38 minutes, and 'keeper Jamie Ewings' heroics kept Sons alive with some superb saves. Both teams created chances in the second half but could not break the deadlock. As the destiny of the Cup went to penalties, Ryan Borris missed the first kick and Sons had to wait until Falkirk's fifth penalty before Jamie Ewings saved to force a decider. Youngster Jamie Lyden could not convert, leaving Jay Fulton to fire in the winner. The sizeable Dumbarton travelling support gave a generous ovation to both sides. (1 Nov 2011). A DISASTROUS six-minute period in the first half cost Dumbarton dear, as they went down 4-3 to Arbroath at Gayfield, despite a fightback that almost levelled the score late in the match. Two strikes and a free kick put the Red Lichties in a commanding position before the break, as Sons' defence looked continually vulnerable from crosses and set play situations. But in a storming second half it was a different story. Battling Dumbarton pulled the score back to 3-2 with goals from Martin McNiff and Scott Agnew. Then just as it looked as if they might equalise, Kevin Nicoll was controversially red carded for a robust tackle. In a frantic end to a tempestuous match, Arbroath struck again to make it 4-2. Then McNiff claimed his second from a header. But ten-man Sons ran out of time, despite maintaining the pressure right until the end. (5 Nov 2011).